Christmas Pepper Jelly- two delicious flavors in one jar, cranberry pepper jelly & jalapeno pepper jelly, two of Aloha from Oregon's most popular flavors. Simply unusual & delicious pepper jelly! Aloha from Oregon has a creative holiday hor's d'oveuvres suggestion... 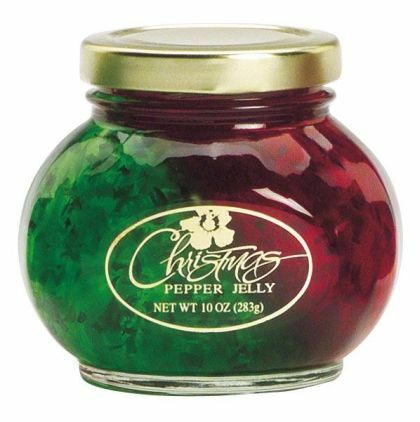 Create a cream cheese Christmas tree & decorate with the pepper jelly-green for the tree & red for the ornaments. Aloha From Oregon Christmas Pepper Jelly / Cranberry-Jalapeno Pepper Jelly.